Its almost fall again and I know all kinds of animals will start showing up at my house once it gets cold. Every year I get mice, rats, squirrels and some kind of shrew or vole. Why do they keep coming to my house? No one else on the block has this issue. I think I’m cursed. Maybe I should just move or will they follow me like the piped piper? 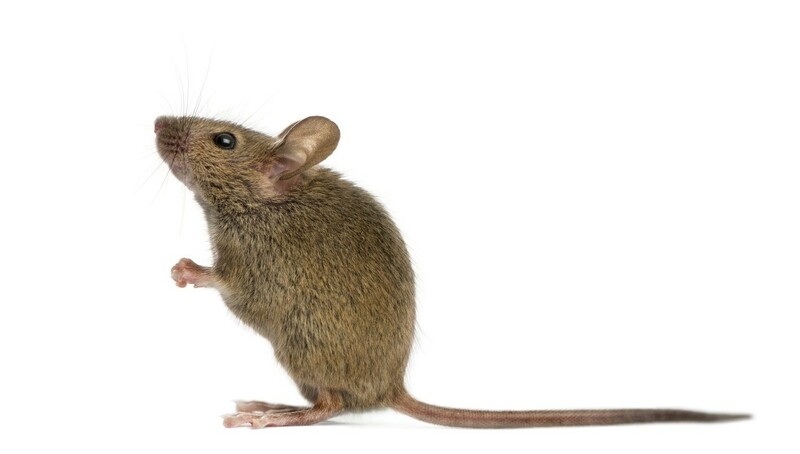 Animals like mice and rats rely on their sense of smell when foraging. And once they find a good place to live or find food, they will “mark” such locations with special excretions or other glandular scent. These odors are sometimes noticeable by people but often they’re subtle enough they go undetected. Once in the yard, on a tree or on the home, rodents who move through the adjoining land will catch a whiff and come to investigate. Since these smells are laid in very specific locations, they can be used as a type of “bread crumb” to ensure the nesting animal can find its way back home. So even if you remove the active animal, the odors it left will linger for years which is why you keep having more activity. To stop the invasions, you first must remove the odor. This is easy to do using NNZ. NNz is an odor neutralizer. Commonly used in attics, crawl spaces or living areas, NNz can be safely sprayed on the home, trees, foundations, grass, plants and pretty much everything surrounding your home. One treatment will usually solve the problem and the further out from the house you spray, the better. NNz will immediately eliminate the lingering odors and scent thus making your home invisible to rodents and other animals again. 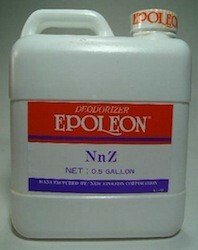 To treat, add 8 oz of NNz to a gallon of water and spray the mixed spray over 500 sq/ft of surface area. Be sure to spray all known sites of activity meaning the foundation for sure. But if they were climbing a downspout or active up in a gutter, you’ll need to spray there too. Attics and crawl spaces with activity should be sprayed too since they will be releasing small amounts of odor through vents. 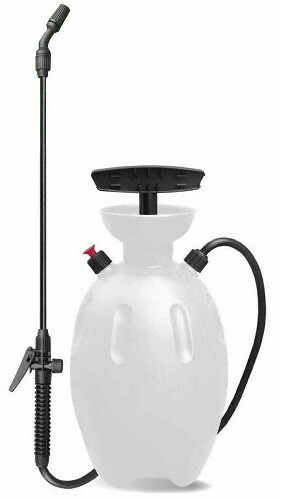 Use any standard PUMP SPRAYER to apply the NNz. For most homes and yards, one application will eliminate the odor immediately but for bad problems (especially in crawl spaces or attics), treating a second time will not hurt as it cannot be “over applied”. Once the NNz is applied, install ULTRA SOUND DEVICES to make it uncomfortable for any animal who wants to use the area. 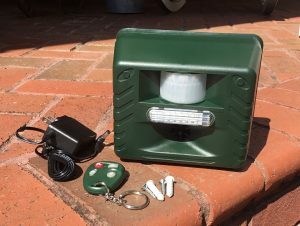 These units are water resistant, easy to deploy and will repel most any animal from the yard or home depending on the setting. They can be configured to run only at night, only during the day or all the time. They also feature a wireless key so you can turn them off/on from afar and they can be powered by batteries or the included AC power supply. 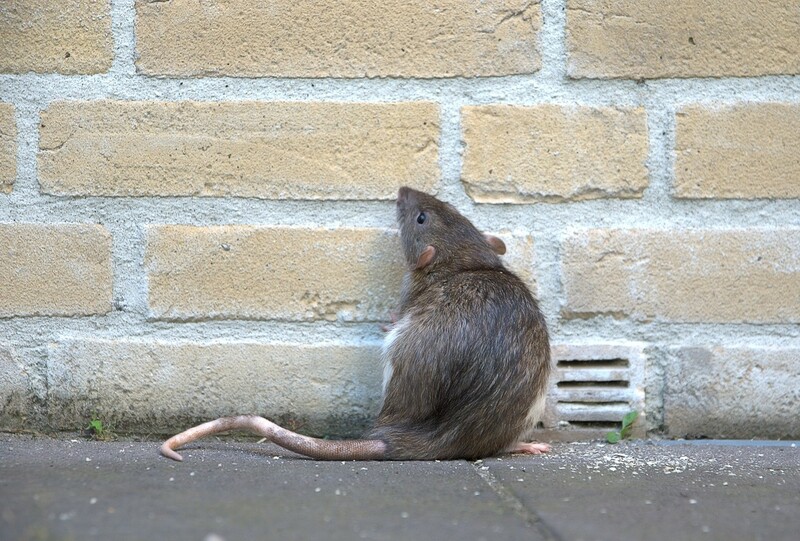 Setting up units around the homes exterior will keep animals away for sure and when installed in a crawl space or attic, no animal will use the area again. For easy installation out in the yard, MOUNTING BLOCKS are handy. They can accept 1 or 2 repellers (picture to the right) and have a 1/2″ hole on their bottom so they will easily fit over a 1/2″ piece of rebar or any other wood or plastic stake. Ultra Sound Repellers will work fine by themselves as long as you have a good place to set them up. In attics, this could be on the floor. But in the yard around the home, we highly recommend getting the Units with Mounting Blocks in the kits we offer. Mounting Blocks allow you to place units anywhere and they will save time too. No doubt homes which get mice, rats, chipmunks, skunk, opossum, voles, shrews or any other animal are more likely to have the problem again. To stop the cycle, treat the home with NNz and install Ultra Sound devices.